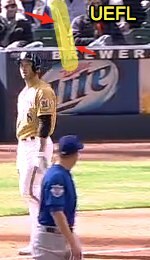 Braun's bat nearly hit himself. from Cubs pitcher Shawn Camp for a called third strike and had previously taken the 3-0 and 3-1 pitches for called strikes as well. Replays indicate the decisive pitch was located off the outer edge of home plate and thigh high (px 1.158, pz 2.491), the call was incorrect. * At the time of the ejection, the Brewers were leading, 4-2. The Brewers ultimately won the contest, 4-2. This is Phil Cuzzi (10)'s 1st ejection of 2013. Phil Cuzzi now has -2 points in the UEFL Standings (0 + 2 MLB + -4 N = -2). Crew Chief Tom Hallion now has 1 point in the UEFL's Crew Division (1 + 0 N = 1). *This call is incorrect pursuant to UEFL Rule 6-2-b-1, the Kulpa Rule. This is the 14th ejection of the 2013 MLB season. This is the 10th player ejection of 2013. Prior to his ejection, Braun was 1-4 in the contest with three strikeouts and a 3-RBI home run. This is the Brewers' 1st ejection of 2013, T-1st in the NL Central (CHC, MIL 1; CIN, PIT, STL 0). This is Ryan Braun's 1st ejection since August 19, 2011 (Angel Campos; QOC = N). This is Phil Cuzzi's 1st ejection since September 3, 2011 (Brian Butterfield; QOC = Y). Good ejection. The bat flip was clearly to show up Cuzzi, hence no argument from either Braun or Roenicke. Considering we have no comment from the Appeals Board on the two previous ejections, I wish to challenge for the same reason: that Braun's bat flip was exclusively what got him ejected, and not the call. This ruling has been challenged and is under further review by the UEFL Appeals Board. We are working on getting that to you as quickly as we can. As for this EJ I think it is pretty cut-and-dry as to the reason for the bat flip and it was in regards to the pitch. I feel that if we keep going down this road that every EJ could be challenged for USC rather then the call in question. I will leave it to the Commish whether to bring this EJ before the appeals board. But those are my thoughts. A missed pitch and an act of nonverbal disagreement used, we can all agree, to show up Mr. Cuzzi. We had this same problem last year where just about every ejection was challenged. Have to figure something else out. Only the 5th EJ of the year and I think 4 were challenged? love brains reaction after EJ, he knows hes gone and if you dont have anything nice to say dont say anything at all! Does anybody know where Jim wolf is?? Haven't seen him on the games the last couple of series'. good point Arik- it's like saying the ejection was for calling the umpire's mom a bad name as opposed to arguing the strike call...it's a slippery slope. I will paraphrase our Assistant Commissioner; "when an umpire is asked why he ejected someone, they never say 'it's cause he didn't like my safe call.' The answer always regards the actions by the ejectee in regards to the call." Ross and Braun were both dumped due to throwing their bats in protest of a strike call. You can go through hundreds of clips on the UEFL page of the same style of ejection. However, not until this year has there been an attempt to challenge the reasoning by saying the act is unsporting but not in regards to the corresponding umpire call. After review, the Original Ruling has been affirmed in a 4-0-0 decision by the UEFL Appeals Board. Four Appeals Board members voted to confirm the Original Ruling, unanimously. It was the bat flip that resulted in the ejection; but the prompt to the bat flip was the incorrect strike call [which, from the naked eye, looked both low and outside, which has been confirmed by PFX]. Citing my previous decision in Guccione 011 and UEFL Rule 6-5.
yawetag moved to table Appeal #4 (014 Cuzzi), which was seconded by Gil. Accordingly, voting was postponed until Ruling 012/013 Fairchild was decided. Because Fairchild was affirmed, 014 Cuzzi was withdrawn, though voting results through the moment of first suspension were captured. Pretty obvious ejection here, throw the bat three stories high and that's automatic. Hopefully, these affirmations will quell this ridiculous surge of challenges based upon "Unsportsmanlike-NEC." I think the Commissioner should use the above precedents to establish a de facto rule which rejects these frivolous challenges before they can be heard by the full Board.